Happy Holidays To All My Blog Friends! 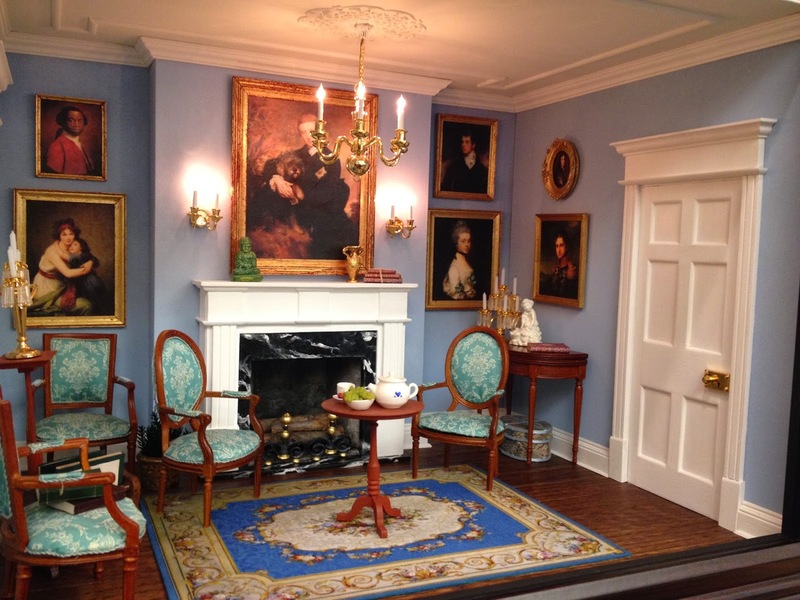 I'm afraid all my holiday concert engagements have kept me away from my miniature projects, so a picture of one of the Thorne Rooms will have to suffice. However, I hope to catch up soon. Until then I wish you all a very blessed holidays. May the holiday season be filled with great joy and love for you all! 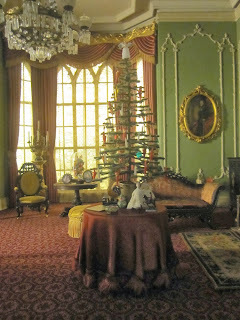 One of the Thorne Rooms decorated for Christmas. I hope you all are doing well. I'm very sorry to have been absent for so long. It's been a challenging couple of months as I juggle things between work and home life. However, I promise to catch up on all your blogs soon. I see there are some wonderful projects going on. They look amazing! I would like to extend a warm welcome to the new followers of my blog. I am flattered that you have joined and I am enjoying reading about all of your work too. Thank you so much for hopping aboard my blog. I hope you enjoy reading my humble posts. Please feel free to leave comments any time. 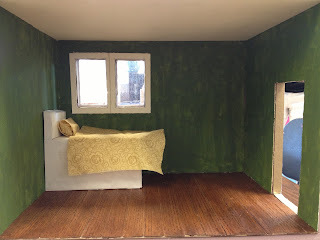 As you may know from my last post, I was working on my very first project titled "The Blue Room." 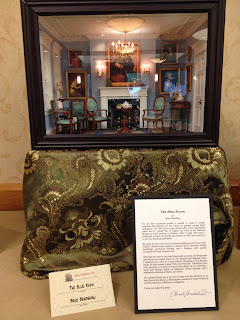 This roombox was to be displayed at the Midwest Miniature Guild general meeting during the first Saturday of October. After a few weeks of intense work and three nights in a row of staying up until 3:30 a.m. (and getting up at 6:00 a.m. for work the same morning), I managed to finish the box. Everything was done--lighting, picture frames and portraits, walls, ceiling, windows, door--everything except the furniture. OMG, what a disaster. 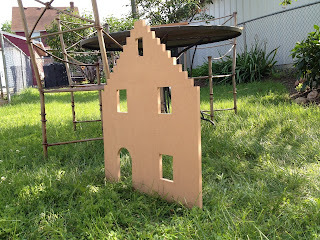 The same week I was to display my work, I took a look at all the furniture kits I purchased. I realized there was absolutely no time to finish them for the coming Saturday show. Luckily, John Elsner from Merriman Park sold me some extra furniture pieces he had in storage. Phew! I was saved. So the Thursday before the show, I took the pieces and started to do a faux wood finish on them with oil paint and liquin. I woke up the next morning and went right into my studio to see how they were looking. Thinking that the paint would be dried, I picked up one of the pieces. Urg! The piece stuck to my hand like it was covered in glue. 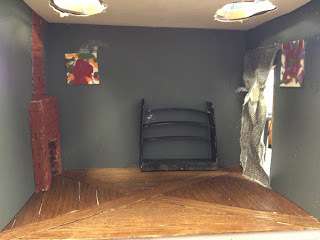 Not only did I ruin the paint job, I realized that this furniture was never going to try in time for the show. I started to get a dreadful panicky feeling in my stomach and thought all the money and time I had spent was going down the tubes. But John again came through and loaned me some of his furniture from his beautiful music room at Merriam Park. A big thank you to John! Here below are the pictures from the show. I think for my first project it turned out ok. There are many things I would do differently, but live and learn I guess. I included the program note below too. 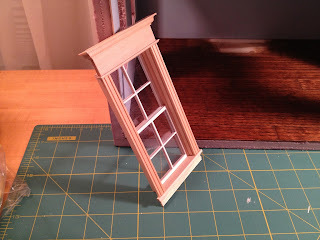 For my first miniature project I wanted to create a simple roombox that allowed me the chance to practice several basic techniques. 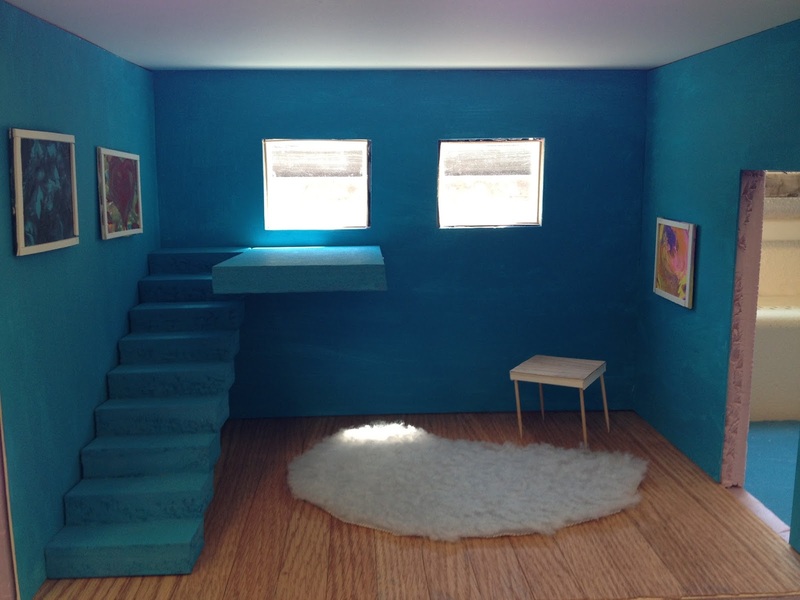 The Blue Room was started after Carol Blanchfield asked me if I would like to display my work at the Midwest Miniature Guild meeting in October. After I spoke with Carol, I swallowed my fear and quickly got started on what has turned out to be a fun learning experience. 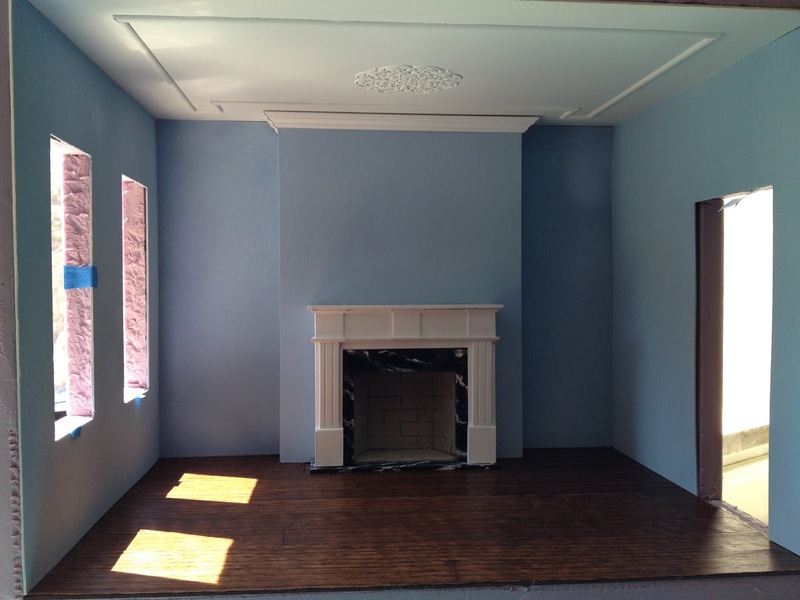 My goals for this room were to practice making several items from scratch—double hung windows, a paneled door, decorative ceiling mouldings, hardwood flooring, and a fireplace with marble surround and brick chimney box. Although the room is far from historically accurate, the design and decorations are loosely based on the Georgian and Regency styles. 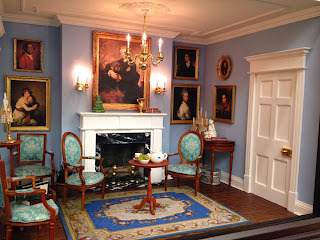 I imagined this room as a small parlour belonging to the Bennett family of Jane Austen’s book Pride and Prejudice. 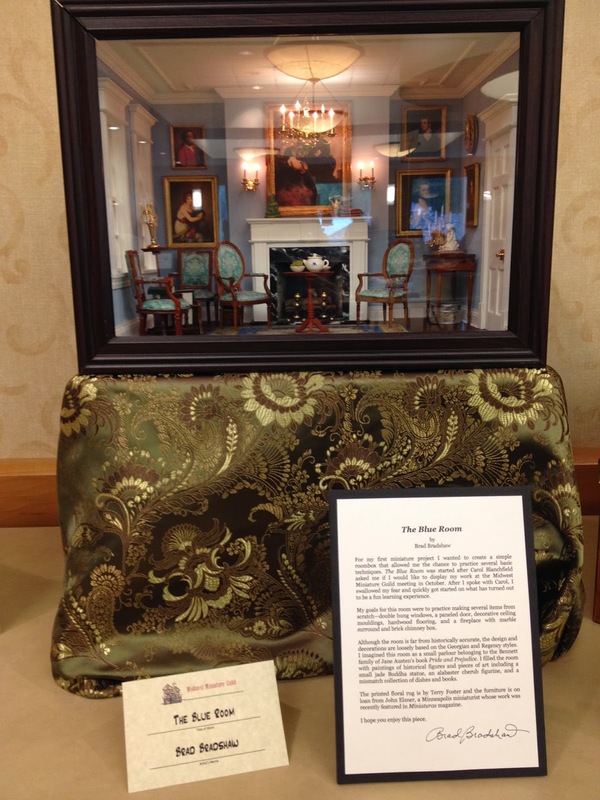 I filled the room with paintings of historical figures and pieces of art including a small jade Buddha statue, an alabaster cherub figurine, and a mismatch collection of dishes and books. The printed floral rug is by Terry Foster and the furniture is on loan from John Elsner, a Minneapolis miniaturist whose work was recently featured in Miniaturas magazine. I am finishing up the furniture that I started in October. I need to reupholstering the couch, make a few pillows and tassels, and fasten hardware. I'll post some updated pictures of the furniture in the room. In the meantime, here's a picture of a few pieces in process. To close I now wish you all many warm blessings and hope you are enjoying your minis too. Many friendly wishes to you. Take care and I'll be in touch again soon. I just had to send out a quick post, for it's been a great weekend for miniatures. We had our Midwest Miniature Guild board meeting this Saturday. I am the new librarian for the Guild and had a wonderful time at my first meeting as a board member. There's a ton of ideas and activities going on with the Guild. What a great group of people! We are so lucky to have an organization like this here in the Twin Cities. If you're in the midwest, please come join the Midwest Miniature Guild! A HUGE thank you to Ilona, Giac, and John for your great advice on fabric resources. Wow. What beautiful selections! I will definitely purse all your suggestions, for sure. Alas time is running out for mail deliveries with this project, so I had to settle on some fabric that I found at a local Joann Fabrics. I found a blue striped fabric for upholstering my couch and chairs. I also was looking for silk scarfs (Thank you, Ilona for the great idea!) and found a blue men's neck tie at Goodwill for $3. I think I will use it for some accent pillows. I'm not that sure how these fabrics will read in 1:12 scale. Fingers crossed. Things are really cooking and time is ticking away. I finished a jade and an alabaster figurine and pick up some other items for the room. 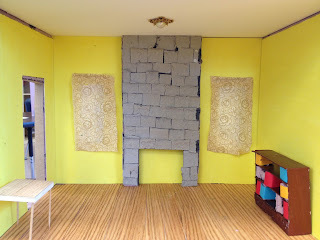 I have to finish the exterior, construct all the furniture, finish the electrical, make a gazillion picture frames, construct and fasten the front frame, and then pray that the few little trinkets I've assembled will look somewhat decent in the room. Here's a sneak peak at the fabric and some artsy chachkies that will be going into the room. Upholster and pillow fabrics with a few items for the Blue Room. Uh oh. Looks like the neighbors are moving in! Ha ha. Don't worry. The modern table lamp is not part of the room. It's just there to shed a little light until the chandelier arrives. Alright my friends, I must get to gittin'. This all is so exciting. I wish you well and send a big, grateful, and friendly heart-felt thank you to all of you for your kind support and comments. Please keep them coming. I will need them for the next two weeks as I meet my deadline for this room box. Zoinks! I hope your projects are going well. I can't wait to see more of your beautiful work too! Just a very quick blog here...The rug for my Blue Room arrived yesterday in the mail. Hurray! I'm so excited. It was made by Terry from www.minibeesknees.com. The colors and details turned out beautifully. Sorry my photos don't do it justice. I can't wait to see what it will look like in the finished room. Now I need to find some fabric that will match the rug. I have a sofa and a few chairs to upholster! Any suggestions on good fabric resources? Thanks again for your kind comments and support. I hope you are doing well! Hey dear friends! How are you? OMG! Life is super busy right now. Summer is almost over and I'm now back to my full teaching/singing schedule. So life is definitely full tilt right now. I want to do a quick post and thank everyone for the supportive and encouraging comments. You are amazing artists and I promise (first promise) to get caught up on your blogs too. You are all doing fascinating work and it's a pleasure to see your beautiful miniatures come to life. Keep up the great work! 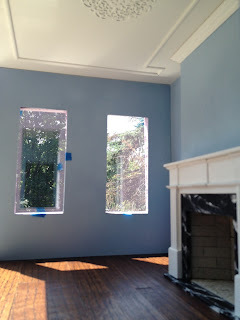 So...my hope is to have my Blue Room done in a couple of weeks. I have to show it for the Midwest Miniatures Guild meeting on October 5th. Gulp. Yikes! More on that later. I want my next post of that project to be a showing of the completed project. Fingers crossed. More to come. 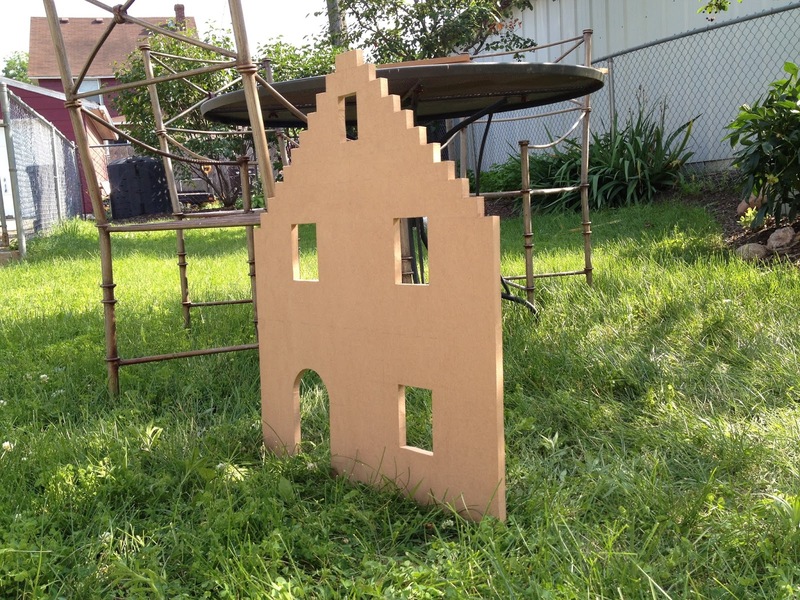 Here's a quick peek at the fixer upper--and it's a real fixer upper. But it was just crying out for some love! So I had to get it. What period style do you think would work for this house? Please feel free to give suggestions or ideas. I would love the feedback! Notice the cobweb above the door frame AND the dead spider in the coweb. 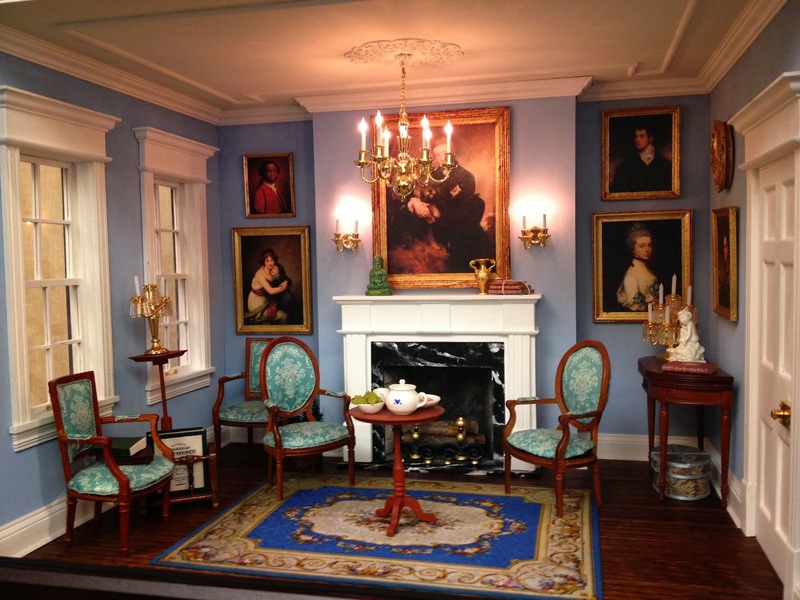 How's that for authentic miniature artistry? Hello my wonderful blog friends! I must apologize. I am so, so, so sorry that I haven't posted since April. It's just been a long and difficult summer, to say the least. Yikes! However, I have done a little work on some miniatures and will soon get back to posting more regularly. A warm thank you to all of you and a friendly welcome to the new followers! You guys are amazing! Thank you for all your kind and helpful comments! Here's something I have been up to this July. I taught a basic miniature room box class to some beginning grade school students. In need of a model for the class, I had to quickly whip up a room box of my own. 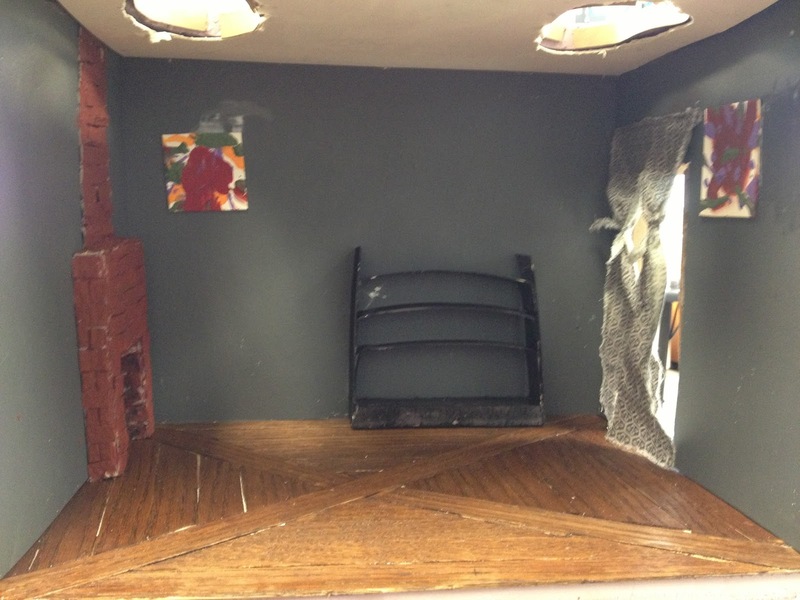 I was able to finish the necessary elements before the class started--walls, floors, ceilings, etc. But after the class was done I just couldn't stop adding more details. It's almost done. I will post pictures of the completed project soon. 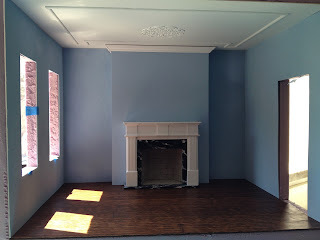 In the meantime, here are some pictures of the "Blue Room" in progress. 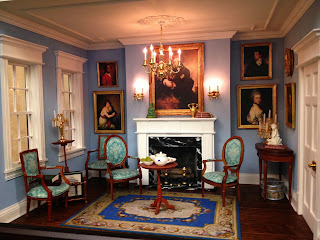 Another look at the Blue Room. 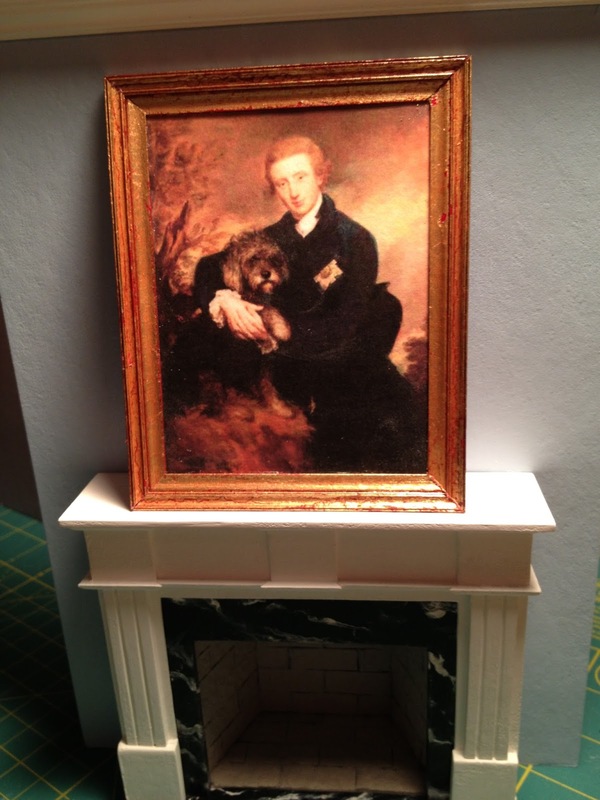 I decided to make a fireplace and a miniature painting from scratch. The painting is of Henry Scott, the 3rd duke of Buccleuch. I saw the RL painting when I lived in Scotland. I love that Henry is holding his dog. There is such a gentle expression on Henry's face. Zoinks! Here I am trying my luck at making widows from scratch. 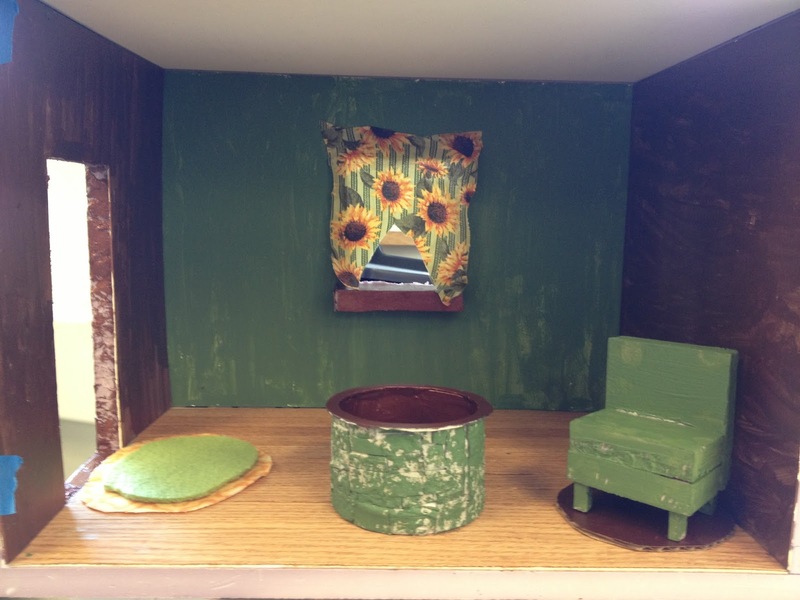 The following are some pictures of my student's work. They had so much fun! It's great to see young kids get excited about miniatures! I think I may have found some future miniature enthusiasts. And yes, I am working on Barton Cottage too. I'll be honest, work is going very slow--but this fall I am determined to get things going full tilt. Christmas is going to be a big goal for me. I want to decorate the cottage, and having the cottage done by the holidays would be wonderful. Fingers crossed. The east side of Barton Cottage. 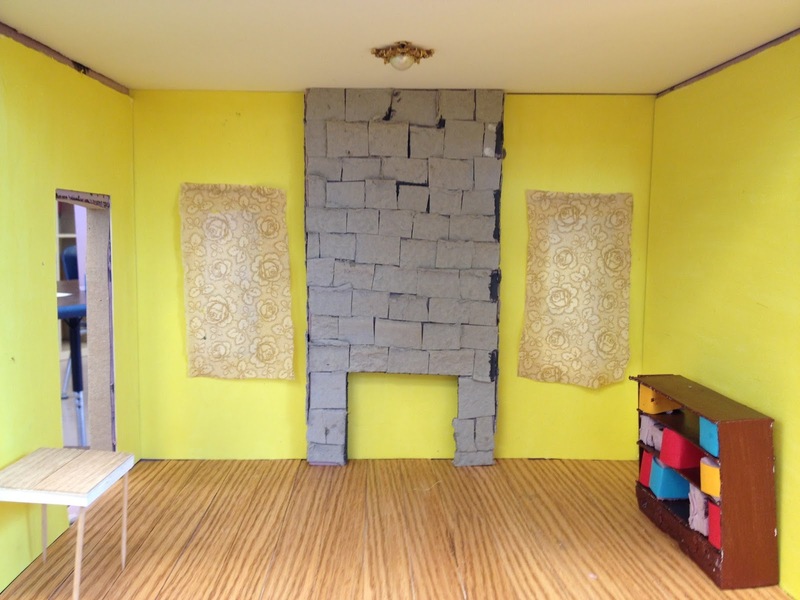 All of the outer walls and floors have been cut out from MDF board. Well, I will be in touch soon. Please keep your comments and suggestions coming. I wish you all great joy and success. I look forward to seeing your projects develop and grow too!